Open the Android Market app , and use the search function to find SkyDroid. Breaking news: GolfSight™ for Google Glass™, just launched. Letting Friends or Followers know about SkyDroid on Facebook, Google+ or Twitter is a great way to spread the word. Use the Recommend, Send, Tweet and +1 buttons on this page. Thank you. 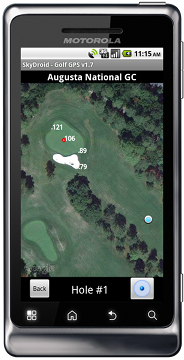 SkyDroid gives you your GPS distance to every green on the golf course, plus distances to many bunkers, water hazards, trees, and target points. With a beautiful design, no subscription charges and no course download fees SkyDroid gives you the simplicity and flexibility you need. 1 Purchase SkyDroid on the Apple App Store , Google Play Store or BB World. 2 Download the courses you play using the Search/Download screen in the app. There are no course download fees. 3 Tap a course from your Course List screen on the app to start playing. 4 If needed, add new courses or edit existing ones using the web based Course Mapper tool. 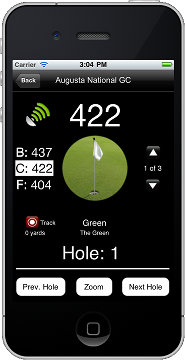 iPhone/ iPad: SkyDroid - Golf GPS works on iPhone with iOS 4.x or above. It will also run on the iPad 3G (as an iPhone app). Android: SkyDroid works on all Android OS 1.5 - 4.0 and Beyond. Note: some tablet sizes may not display the main Distance screen perfectly, let us know. iPhone/iPad 3G: Version 1.8 is a new release offering some improvements to GPS, course finding, auto-advance, satellite screen rotation and more. Android: Version 2.0 is a major release adding Scoring (single player) and Statistics to the app. We've addded a bunch of new screens and a ton of functionality. Android users: We've just released SkyDroid 2.0 with a ton of new features, please Email us with what you want to see next. iPhone/iPad users: Map Updates coming->We are working on an update that will give you the choice between Google Maps and the new iOS6 maps. Should be ready by end of November 2012. Then we will be looking to add scoring and stats features to the app. Really just $1.99 - $2.99 ? We get asked all the time whether the app is really just $1.99 ($2.99 where Sync. is included) and if there are any monthly, yearly, usage or course download fees. But believe it, it's just a single charge of $1.99 (USD). On our new SkyDroid 2.0 version for Android devices we do give people the option to unlock the Synchronize Scores feature for an additional one time fee of $1.00. On Blackberry 10, and on the Amazon app store, the price is $2.99 but no additional charge for synchronizing scores.